Live the life you were meant to live at Turtle Creek. Keep up with your friends and neighbors in one of our many gathering areas including our lounge with fireplace or one of our two activity rooms. We proudly offer several activities per month in large community room including chair yoga, bingo, birthday celebrations and more. To help keep you fit and moving, we offer a fitness center with cardio and strength equipment. We also boast an on site beauty salon and barber shop! On beautiful summer days, you can enjoy our patio area with grilling stations, or access the Amherst Bike Path directly behind our community. For your convenience we also have a centrally located elevator and two laundry rooms on each floor. The fabulous amenities are just some of the reasons our residents love to call our 55 an older community Turtle Creek home. Each of our one and two bedroom apartment homes are equipped with modern features such as maple cabinets and neutral color schemes. 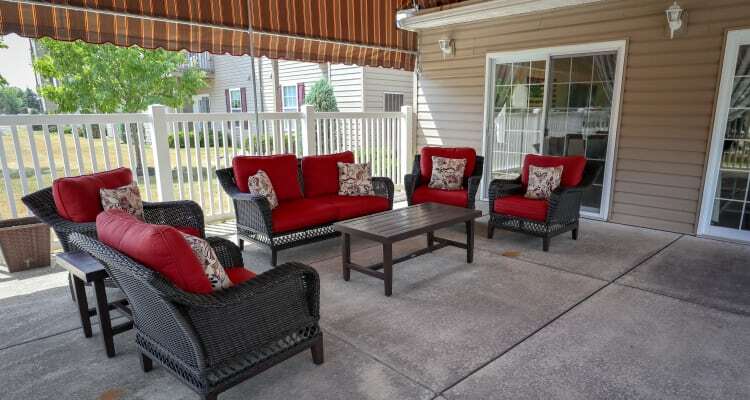 You will find our large living areas complimented by our private patios and balconies. Turtle Creek is also proud to offer pet-friendly apartments.